Either refers to any one of the two things or people. Either is always considered singular in a sentence. Either… or is a correlative conjunction. We use either … or for connect things which are the same types, phrases, clauses or words. I’lleither write to you or phone you next week. Neither is used as a conjunction. 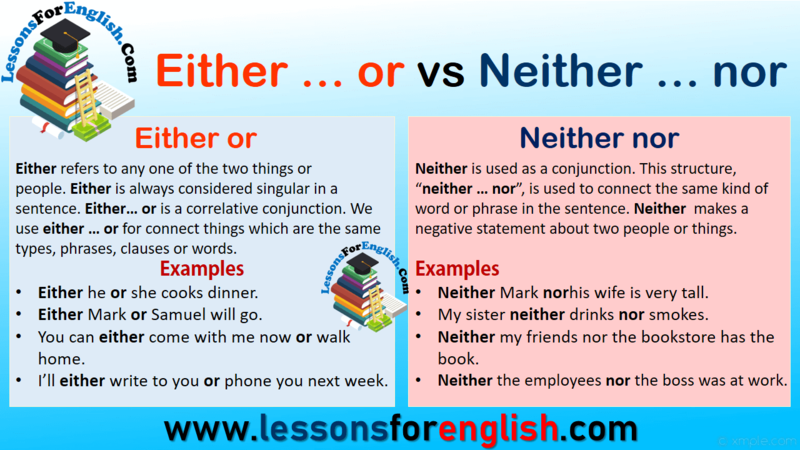 This structure, “neither … nor”, is used to connect the same kind of word or phrase in the sentence. Neither makes a negative statement about two people or things. Neither Mark norhis wife is very tall. My sister neither drinks nor smokes. Neither my friends nor the bookstore has the book. Neither the employees nor the boss wasat work.